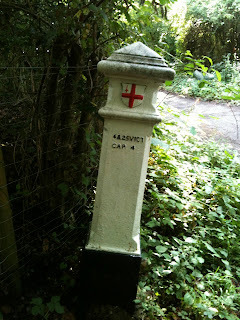 On Saturday 27/08/2011 we went for a walk on the North Downs, to be precise, The North Downs Way. Not the whole thing mind you, just the section from Reigate Hill to Box Hill. We've been, as Bill Bryson would term it, section hiking the trail for the last two years with the kids and Mr. and Mrs. D - the in-laws, doing short sub-10 mile stretches, two or three times a year. At 150 miles long it's going to take us a while, we've probably managed 30ish miles so far, but we're doing it this way to get the kids used to longer and longer days of hiking. So, whereas the first few sections came in at under 5 miles, Saturday was an 8.5 miler. It's also a gentle way to do it, never that far from civilisation, so a pub lunch is always an option, more of pub lunches later. The planning for these jaunts always begins with epic whinging on the part of my son who claims not to like walking, but inevitably ends up thoroughly enjoying the day, and so it was that on Saturday morning there was much wailing and gnashing of teeth when he decided he was staying at home. As he is only 9 (going on 16) this is not an option so he is persuaded into his boots and off we go. A car is first dropped at the foot of Box Hill in the Stepping Stones car park then we all pile into one car, legally I assure you, and we head back to the car park marked on Mr. D's, OS map. Unfortunately this map was printed in 1995, so the magnetic declination wasn't the only thing well off, turning to the maps he'd also printed from memory map we discovered that sometime in the last sixteen years the car park had migrated four hundred yards south where it was now enjoying a splendid view over Reigate, Redhill and beyond. On arrival we discovered a veritable theme park as far as National Trust car parks go - cafe, toilets and even deck chairs - it was all we could do to keep Mrs. D settling in for the day. And we're off and looking at the sky I make the decision to leave my waterproof in the car, I say waterproof, I'm not sure it qualifies anymore, it's ten years old, leaks and is about as breathable as a black bin bag. I'll rephrase that - looking at the sky and seeing it's blue and cloudless, I leave my third layer in the car. The Fort, looking South - Casemate far right. Our first stop was Reigate Hill Fort, built in the 1800s at a time when confidence in the Royal Navy was at a low ebb and fear of French invasion at a high. It is one of thirteen forts built to the south of London; these forts were not designed to be heavily defended castles but more resupply points for mobile units of soldiers. Having said that, the earthworks are pretty impressive and the buildings, Magazine, tool store and Casemate, still exist, although they are locked up and one has to be satisfied with looking through the windows. Between the tops of Reigate Hill and Colley Hill is what the National Trails website calls Reigate Temple, although this is the only place I can find it called this. Other sites I have found refer to it as the Inglis Memorial. Lieutenant Colonel Sir Robert William Inglis donated it to the Borough of Reigate in 1909. I am struggling to find any information on Lt. Col. Inglis, but his memorial is little gem, just take a seat inside and look up and there is a beautiful mosaic ceiling depicting the celestial realm. It was originally a drinking fountain for horses on the original route over Reigate Hill, this got me thinking about how quickly society can change - in 1909 the motor car was still a rare thing, no one even considered that we would need a vast road around London carrying cars at <ahem> 70 mph and yet just 102 years later the old main route over the downs into Reigate is a footpath and from that footpath you can hear a constant, if distant roar, like the crashing of a waves on rocks that is the sound of hundreds of cars a second passing on the nearby M25. Moving on west from the Inglis Memorial the ridge of the Downs curves south west and the views toward Dorking are superb. Brambles, which, on Saturday were fruiting nicely, border the trail but I'm not sure how many berries were left by the time the kids had grazed their way along the hillside. The trail then plunges into the woods, woods that are mainly made up of Yew, Ash and Hazel, some of the specimens of Yew are ancient and have been shaped by the ages into incredible forms. About a mile further on we find a curiosity at a junction where our path meets one heading North towards Mogador. Leaning at an angle is a cast iron post, painted black and White with the shield of the City of London embossed on to it and a series of numbers and letters. 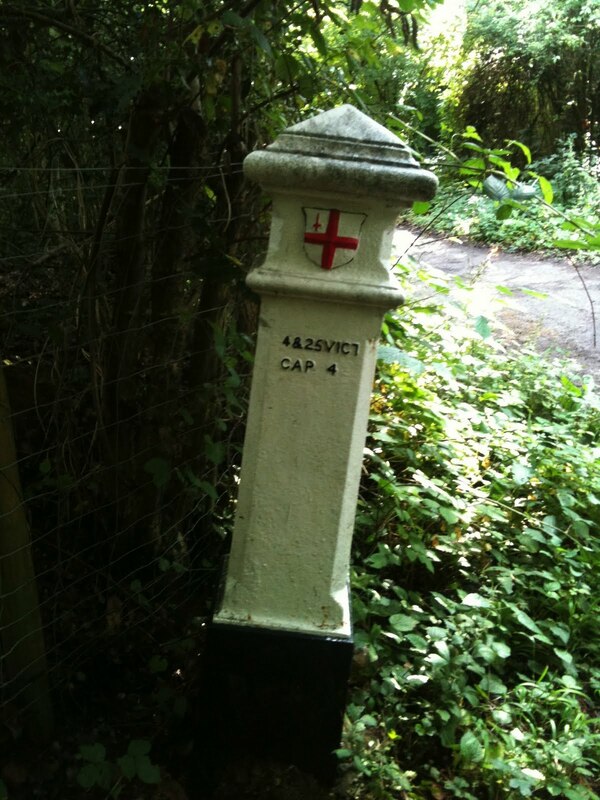 It almost looks like a fancy mile marker post but the inscription appears meaningless, I take a photo in my iPhone and post it to Twitter asking for suggestion and very soon three chaps have come back to me - it's a Coal Tax post. These posts were erecting in the 1850's in a ring around London marking the point at which commodities (such as coal) were taxed on entering the City of London. There are a few examples left of these posts and we discover another a few hundred yards further on. The trail then takes a left turn and we descend to the foot of the downs, knowing full well that we'll only have to climb to the top again. Walking along the bottom of the downs and looking up I can see the ridges formed when soil is washed down the steep face by rain and then a large bird of prey catches my eye as it skims over the scrub, it looks to be a Buzzard and soars lazily along before alighting on a tree branch just outside of the effective range of the lens on my Nikon. We then begin another ascent and come to a T junction where the fingerboard instructs us to turn right in order to continue on the North Downs Way, as we turn I feel a few spots of rain and begin to think that leaving the “third layer” behind was a bad idea (yes, I know, you should always carry a waterproof), however five minutes sheltering under a particularly impressive Yew and the skies cleared. Just north of Betchworth Station the path comes out onto Pebblehill Road which despite its seemingly tranquil, rural location was actually rather busy and great care had to be taken with the little ones as the footpath is a tad thin on occasion. The stretch of roadside walking is only about half a mile, downhill, I hasten to add - in other words, there’s another steep climb coming, and then a right turn takes you a little country lane flanked by houses and back onto the footpath proper. Passing the old Betchworth Lime works on the left with its impressive brick limekiln tower and ascending up to the top of the old quarry provides another stunning view and an information board showing the various species of local flora and fauna. Although if you look carefully it would appear that a number existed before the 6 of the first date, this seems to have eroded away over the years. 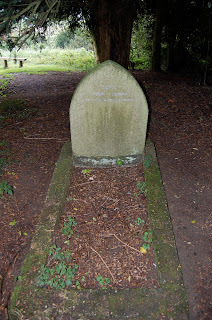 My first thought was that the grave was that of a house, however a little research reveals that it is actually the final resting place of a Greyhound, to be precise, the favourite Greyhound of the wife of a Mr. Barnholdt, a Danish immigrant and owner of the land at the time. Soon after this the question of lunch arose, the walk had so far taken a little longer than planned, partly due to a navigational misadventure where it appeared a fingerboard had been tampered with (we were never lost, we had just misplaced our position). The original plan was to complete the walk, jump in the Landy and drive to a pub, however when the newer map was consulted we saw a pint pot about a mile from the top of Box Hill and not far of the path, we decided that we’d investigate this as a source of sustenance. Seeing that it was not present on the 1995 map, I had already concluded that it wouldn’t be the stone-floored, low-ceilinged ye olde hostelry of my dreams but imagine my surprise when I stumbled out of the woods into the car park of a Smith and Western American South-West themed restaurant. Nosebag was needed so we piled in rucksacks and walking poles all and settled down to all things deep-fried and burger-like. The kids, of course, loved it, and although a little slow, the service were good and friendly. The food was pretty good as well and from someone who’s spent a little time in the south-west US its not a million miles away from authentic especially when washed down with a couple of Coronas. I still can’t escape from the nagging unreality of taking a break from our walk in the Surrey Hills to have lunch in a wild-west jailhouse though. An hour and half later we waddle out of the restaurant and back onto the trail where it takes a mere 20 minutes to drag our distended stomachs to the top of Box Hill where, by now, there is glorious sunshine and the view south is stunning. We pause for a few moments to enjoy the view and take the obligatory trig point photos before beginning the descent to the car park. Unsurprisingly the path to the Stepping Stones car park is signposted as the Stepping Stones Path; which makes navigational choices a doddle. Strangely it hasn’t dawned on me that a Stepping Stones Path leading to a Stepping Stones Car Park may at some point involve Stepping Stones and so when we encounter the river and its single line of stepping stones they come as something of a surprise. Son bounces across the line of wet concrete pillars with little concern and I follow, the water looks pretty deep at the stones, looking upstream one can see the river bed through the clear water, but not under the stones, where the water is murky and the bottom invisible. Fifty yards later we’re back at the car. So there we are, another section done, 8 and a bit miles, the kids have done really well and we’ve all enjoyed ourselves. Great views, reasonable weather and good company, that’s what its all about, isn’t it? I found this grave today! I’d love details/sources for your research. I'm afraid its been so long that I can't now recall where I found the information, a google search only brings back this blog and a few other mentions since. I'll keep looking and see what I can find!